Black pepper is a flowering vine in the family Piperaceae, cultivated for its fruit, which is usually dried and used as a spice and seasoning. The fruit, known as a peppercorn when dried, is approximately 5 millimetres in diameter, dark red when fully mature, and, like all drupes, contains a single seed. 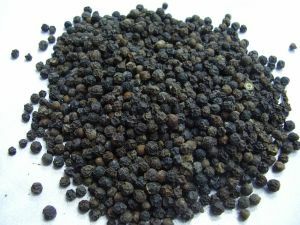 Peppercorns, and the ground pepper derived from them, may be described simply as pepper, or more precisely as black pepper (cooked and dried unripe fruit), green pepper (dried unripe fruit) and white pepper (unripe fruit seeds). Dried ground pepper has been used since antiquity for both its flavor and as a medicine. Black pepper is the world's most traded spice. It is one of the most common spices added to European cuisine and its descendants. The spiciness of black pepper is due to the chemical piperine, not to be confused with the capsaicin that gives fleshy peppers theirs. It is ubiquitous in the modern world as a seasoning, and is often paired with salt. Black Pepper Aids Your Digestion: Over-the-counter medications like Tums, Mylanta and Pepto Bismol are popular because people are constantly plagued with indigestion after they eat. One of the amazing health benefits of Black Pepper is, it actually aids your digestion. When you eat Black Pepper, your taste buds become stimulated. They send signals to your stomach telling it to increase its production of hydrochloric acid. This acid helps your body digest food so you don't suffer from indigestion. Black Pepper can also help prevent the formation of intestinal gas and reduce stomach upset. Black Pepper and Anorexia: For people who suffer from mild Anorexia, Black Pepper can also help them regain their appetite because it stimulates their taste buds. Black Pepper and Congestion: Add Black Pepper to your diet, and this spice will help break-up the congestion, especially if you add it to a strong, steaming hot cup of mint tea. Black Pepper and Healing Cuts: Another amazing health benefit of Black Pepper is, that it's a handy spice to have in the kitchen for when you cut yourself. The next time you have a minor cut, sprinkle Black Pepper on it. It will help stop the bleeding. Plus, it's antibacterial properties will promote healing and kill germs. Storing Black Pepper: Black Pepper is ground-up Peppercorns (berries) that come from the Piper nigrum L vine. The freshest, most potent Black Pepper you can get is to buy Peppercorns and grind them up as you need them. To keep them fresh, store Peppercorns and ground Black Pepper in airtight containers away from light.